The European Comission has questioned on Tuesday that Spain will meet its renewable energy target by 2020. Brussels includes Spain in the group of six countries -where are also Austria, Germany, Latvia, Slovenia and Slovakia- in which there is "some uncertainty about if they will achieve "reach the goals they have set. 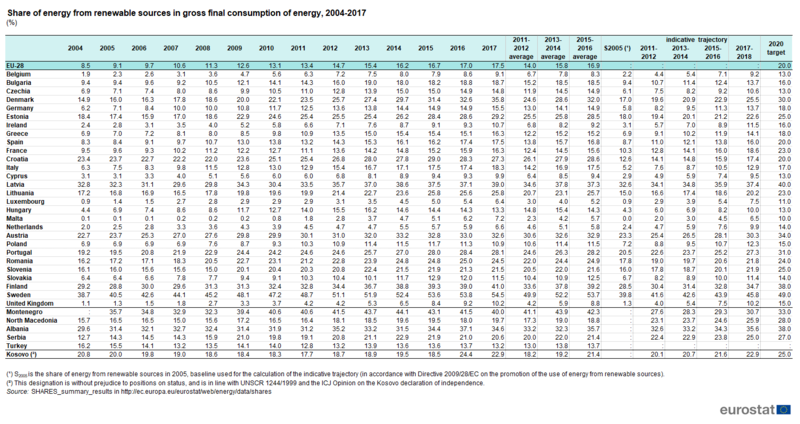 In the case of Spain, 20% of the final energy consumption in 2020 must come from renewable sources. In 2017, the year taken as reference by the Commission for the evaluation presented on Tuesday, the share of renewables in Spain was 17.5%, two and a half points below the target it should reach by 2020. The analysis of the renewable targets of the EU members are included in the report on the "energy union" that has been presented this Tuesday in Brussels. According to the Commission, the EU as a whole is on track to meet the 2020 target, which is that 20% of all final energy consumed comes from renewables. But this does not mean that all countries meet their national objectives; that is, it will reach that 20% thanks to the extra effort of some members. Each country of the EU was set its own goal according to their socio-economic conditions and the point from which they started. And in 2017 there are already 11 EU countries (Bulgaria, Czech Republic, Denmark, Estonia, Croatia, Italy, Lithuania, Hungary, Romania, Finland and Sweden) that had reached the quota set for 2020. Another 11 States have policies " insufficient "to be able to comply: Belgium, Ireland, Greece, France, Cyprus, Luxembourg, Malta, the Netherlands, Poland, Portugal and the United Kingdom. Finally, there is the intermediate group - in which Spain is - for which Brussels warns of a "certain uncertainty" as to whether it will comply. The report highlights that the EU will meet its global target by 2030. However, it points out that "Efforts must be intensified "to meet the objectives of 2030. By then, the share of renewables will have to be 32% In any case, the European Commissioner for Climate Action, Miguel Arias Cañete, affirmed on Tuesday that The EU "has put in place the world's most ambitious legislative framework on climate and energy" in order to meet those 2030 targets.